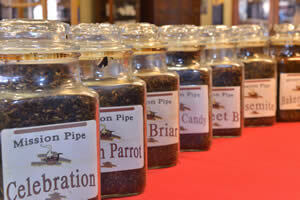 The following are the traditional definitions of the base tobaccos used to make pipe tobacco blends. We hope they will be of some help in understanding the often confusing multitude of descriptive labels applied to blends from different manufacturers. VIRGINIAS: The highest in natural sugar content so obviously the naturally sweetest of all tobaccos, Virginias (also known as flue-cured) is the meat of blending tobaccos. Usually identified by the color of the leaf (red, bright, lemon, etc), Virginias are today grown all over the world. The color of the leaf is affected by how low or high on the stalk the leaf comes from, and as a rule of thumb the lighter the leaf, the more tart the taste. Because of the high natural sugar content, Virginias are notorious for causing "tongue bite" if smoked too hot, but once the smoker learns to puff slowly and gently, the taste is well worth the learning curve! BURLEYS: If Virginias are the meat of blending tobaccos, Burleys are definitely the potatoes. Burleys have practically no natural sugar content but are often higher in nicotine than Virginias. The lack of sugar can make Burleys a perfect "filler" in a blend, both because it absorbs flavorings very well and can be used to add fullness and a nicotine kick to a blend. Good quality Burleys have a natural slightly nutty flavor and are quite flavorful in their own right. BLACK CAVENDISH: Historically a type of cut for tobacco, "Cavendish" has through the years come to refer to a style of tobacco. Because of the relative blandness of Burleys, Cavendish is usually made from Burley tobacco. Black Cavendish is made by subjecting Burley to a combination of heat, steam and pressure. As mentioned above, since it absorbs flavors well Black Cavendish is a staple in many aromatic blends. As a rule of thumb Black Cavendish manufactured in the U.S. has some type of sweetener added by the maker while traditionally English Black Cavendish is unflavored. ORIENTALS (or TURKISH): Grown mainly in Greece and Turkey, Orientals are the spice of blending tobaccos. They typically are naturally oily (which contributes to the flavor) and the leaves are smaller than Burleys and Virginias. In fact, the smaller the leaf the higher the quality is the rule of thumb with Orientals. Orientals are often subcategorized by the region in which they are grown, such as Basma, Drama and Izmir. LATAKIA: Latakia is actually Oriental leaf which is smoked over an open fire, giving it the distinct dark color and smoky flavor and aroma. Taste being a subjective thing, some will often pick up a bit of sweetness from Latakia, but smoky is the characteristic usually associated with it. Practically all of the world's supply of Latakia is produced in Cyprus, hence the name Cyprian Latakia. Latakia is traditionally a staple of what are referred to as English blends. PERIQUE: At its heart, Perique is actually Burley tobacco which gains its distinct aroma, taste, appearance and feel from a fermentation process discovered and developed in St. James Parish in Louisiana. While many pipe smokers will experience many different flavors and taste sensations from Perique, the most prevalent flavor is one of stewed fruit (which fruit depends on the individuals taste buds). Practically all of the world's supply of Perique comes from the L.A. Poche Farm in Louisiana. ENGLISH: A blend which contains Latakia. BALKAN: Latakia and Orientals are added to a base of Virginias. English blends may or may not have a percentage of Orientals but Balkans will always have Oriental added. SCOTTISH: Traditionally Scottish blends will have a bit of unsweetened Black Cavendish added and may or may not include Latakia. AROMATICS: A blend with some type of flavoring added, usually to a Cavendish base. Typically, the addition of spirits (rum, bourbon, etc.) are considered natural flavors so are NOT classified as aromatics. ENGLISH AROMATICS: A blend that contains both a flavoring additive and Latakia. Used with permission of Cornell & Diehl, Inc.